A box of DK Books arrived on my doorstep quite by surprise this past week. We opened it with excitement and curiosity and one of the treasures we found inside was Nature Explorer . This book is divided into six sections: Birdwatcher, Bug Hunter, Star Gazer, Rock & Fossil Hunter, Nature Ranger, and Weather Watcher. We live in a log house and birds seem to like it very much. So we've had our fair share of birds "knocking" on what I'm sure they think is a big tree. We had one bird try to build a nest on one of the extremely shallow eaves, giving credence to the term 'bird brain.' All of our experiences with birds this spring have made Nature Explorer all the more intriguing for Bookworm1 as we now have points of reference. He has also developed a wonderful (?) fascination with bugs and insects of late and so we've been reading anything about insects that we can get our hands on. We've also gone "bug hunting" a time or two in our yard. Nature Explorer gives tips in the bug section about the best places and time of day to find insects, tells you what you need to have in a "collection kit" and a various assortment of other things. On the whole, I'd say that this 251 page book is an absolute winner for toddlers - elementary aged children. There are simple experiments scattered throughout the book, photographs which help explain everything being described, and a glossary in the back to help defined any unknown terms. 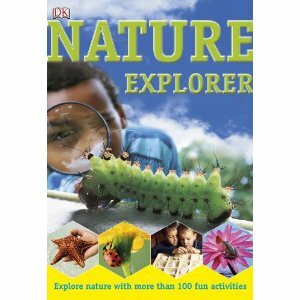 We couldn't be more satisfied with Nature Explorer and think it was a pretty awesome treat to land in our mailbox. Thanks, DK Publishers for providing it for our perusal! We haven't done much more than browse through this book yet, but I'm looking forward to checking it out in more depth soon. What a great surprise to find on your doorstep! I can't seem to get my ID verified to comment at your other blog, but the sea books there look awesome for you too. DK kids books are awesome! We love the biographies and the "eyewitness" books. What a terrific book!! We're studying birds, bats and bugs for science in the new school year and this book would be a great supplement!